locally known as the Cats Back and the Offa's Dyke Path. To get there heading from Hereford on the A465 you need to goto Longtown which is sign posted and is a right hand turn. If you require some bits and bobs for your days outing the Hopes of Longtown shop has everything you should need, post code HR2 0LT. Who will be happy to give you directions and information about the area. follow ths sign, the SO coordinate you require is SO 28840 32857. Here you will find a couple of pic nic benches and parking for a dozen cars. The start of the walk is quite hard work to do initially, but once the 800' climb is out of the way you can just enjoy the views. With the Offas'd Dyke path running parrallel with the Cats Back. The ridge itself only lasts for a mile. As the hill flattens out you will arrive at Craswall trig point. A good place to stop and admire the views. Carry on along the path until you reach a junction with a small pile of stones and turn sharply to your left. You will drop down gently the side of the ridge into the Olchon Valley. There are some pretty streams and a small rock face on your way down. Eventually you join the road and follow it until you see the turning to the car park. 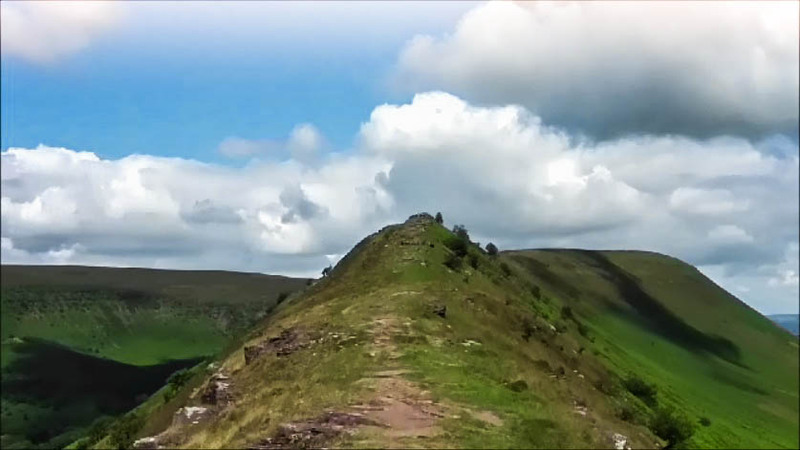 If you prefer a longer walk do not turn left at the pile of stones, keep walking and this will take you onto the Offa's Dyke path, just bear left and you will have magnificent views of the Cats Back you have just walked with further fabulous views of the next valley. You will reach a trig point along the Offa's Dyke path where you can rest and have a bite to eat. It was at this point that I decided to make my way back, the days walk took about 5 hours with many stops for me taking photographs. On the return walk about 16:30 the light had changed which gave opportunity for another photograph of the Offa's Dyke path. This article was written by http://www.goherefordshire.co.uk, the UK's largest holiday accommodation directory for Herefordshire.